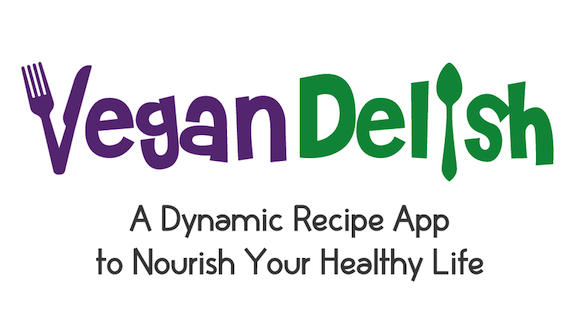 If you’re a plant-based cook or a food blogger – unless you’ve been living under a block of pressed tofu – you’ve probably heard or seen a nifty app for iPhone and iPad called Vegan Delish. Carrie Forrest (Carrie on Vegan) is the woman behind this amazing product. I was lucky enough to win myself a free download and let me tell you, this is one powerful app! It’s like having a plant-based cookbook in your pocket. I find Vegan Delish especially appealing because Carrie and her contributors nix processed foods and go light on sugars and oils. This is exactly how I run my own kitchen. Start out by scrolling through Recipes presented in alphabetical order. Or select from 22 different categories such as Raw, Kid-friendly, Smoothies, Oil-free, Holiday, and more. Select a recipe and you’ll notice that each one is rated and even includes comments from people who have made them. Ingredients for each recipe are listed in bold and you can add items directly to a Shopping List. You can also change the quantity and the ingredient list updates automatically. Recipe steps are short and easy to follow. Carrie also lets you know what equipment you’ll need to make a recipe. Love a recipe? Add it to Favorites. Click on References and you’ll find a Table of Standard Measurements and a list of recommended websites and equipment. I love the Kitchen Timer located under More. Carrie adds new recipes frequently (she just added a bunch for the holidays) and includes recipes from several contributors. Carrie has generously given me the opportunity to give three of my readers free downloads of Vegan Delish. Enter via Rafflecopter at the end of this post. If you simply can’t wait and want to have this great app on your iPhone or iPad now, click here to purchase from iTunes. Before you go, though, be sure to snag Carrie’s recipe for beautiful butternut squash soup garnished with a rich cream sauce – perfect for the cooler weather. Giveaway ends at midnight on November 19. Although this giveaway is open only to residents of the U.S., Vegan Delish is available for purchase internationally. Peel, seed, and cube squash. Chop onion. Slice mushrooms. Mince garlic. In a large pot, bring water to a boil. Add onions and cook for a few minutes over medium heat. Add mushrooms and cook until softened. Add garlic, pumpkin pie spice, no-salt seasoning, and oregano. Stir in butternut squash and vegetable broth. Add water if necessary to cover vegetables. Bring squash mixture to a boil. Reduce heat to low, cover, and simmer for 20 minutes or until squash is tender. Rinse and drain beans. Stir into squash mixture and cook just long enough to heat through. Remove from heat. Using a hand immersion blender, process stew to desired consistency. Stir in Non-Dairy Cream Sauce and serve hot. Shared with permission from Carrie Forrest. Combine cashews and non-dairy milk in a high-speed blender and process until smooth. Carrie Forrest is a graduate student in public health nutrition, author of the popular blog, Carrie on Vegan, and creator of the best-selling app for iPhones and iPads, Vegan Delish, featuring healthy recipes using whole food ingredients. As a thyroid cancer survivor, she is keenly aware of the health benefits of a plant-based diet. Carrie has been vegan since 2010 based on her love for animals and a commitment to making the world a more compassionate place. This giveaway available to iPad and iPhone users only. This giveaway is limited to residents of the U.S.
Three people will win a free download. This giveaway is open until midnight on November 19. Enter the Vegan Delish giveaway! I have the app and love it!!! Have you made the cauliflower pizza crust? Really yummy. I’m constantly amazed by the apps people come up with and that’s a great idea for one. The soup looks delicious. I know!! And I keep wondering why haven’t I come up with something clever. My mind just doesn’t work that way, I guess. This sounds like a wonderful app! I create a weekly shopping list every Saturday night. I have tried winging it, but the result was a fail. It’s so handy. Everything I’ve made from it so far has been delicious – and easy. I also HAVE to have a shopping list with me. Otherwise my mind goes completely blank at the store. I’m a weekly grocery list person. Me, too, Deanne! I feel naked without my list ;-)! Will it work on an i-touch.. as an Itouch is like an iphone without the phone capabilities…? I would love to get this app.. I struggle with figuring out what to eat… and I think this app would help. I’ll find out from Carrie and let you know. I’m really enjoying this app – I’m sure it would help you! Cat, Carrie confirms that as long as your iTouch is wi-fi enabled, you could use Vegan Delish on it. A friend of mine mentioned this to me, but couldn’t remember the name of the app – thank you for the post I’ll be downloading shortly!! I have the app too! I love how pro it all looks and all the search categories are particularly useful. You must make the PB & J pie! Thanks for the tip – sounds yummy! AHH I’ve been living under my tofu block, I’ve never seen this app. HOW COOL!! Emerge and see the light, dear Brittany ;-)! TODAY is the FIRST time in over two years of being plant-based that I am actually putting together a meal plan for the week (per the hubbys request). Normally I just go to the grocery store every other day, lol!! This app would be awesome!! Hubby put his foot down, eh ;-)? I’d be completely and utterly lost without my shopping list! We’d have beans and rice every night! PS it’s a fantastic app! I always have a list, lol. I just do not normally plan my meals for the week. I just go in with a list every other day. I will for sure be getting this app!